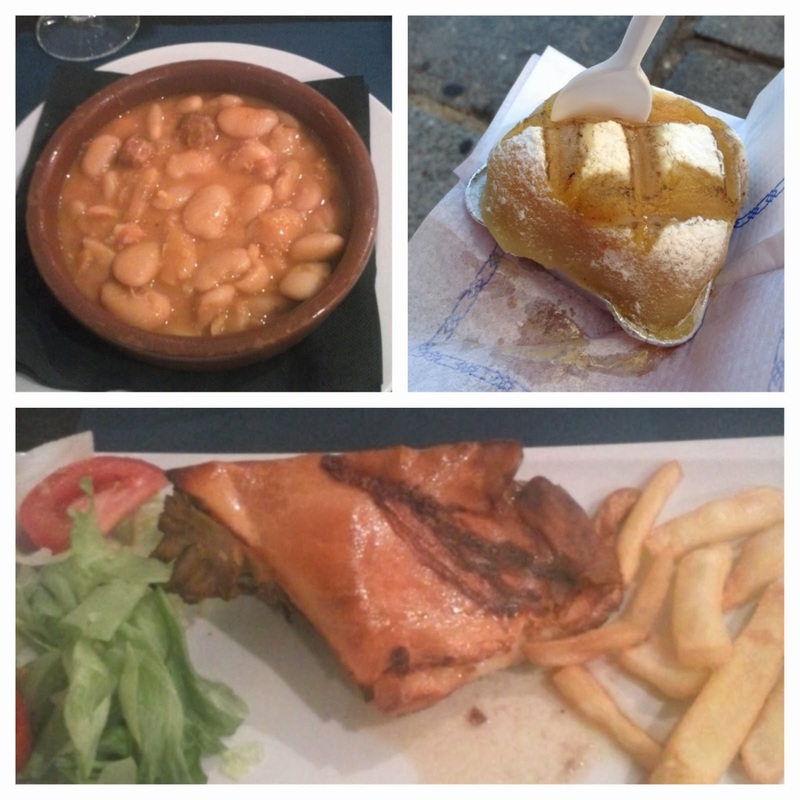 Not even two days back in Spain in September, I had already hit the ground running after a summer home in Texas. The central city of Segovia was the only pitstop I made on my journey between Madrid and Galicia, where I’m now working for Year Two as a language assistant. Merely half an hour north of Madrid via the high-speed train that cuts through the Guadarrama mountains, Segovia is one of the most beautiful cities I’ve been to in the country so far. Most people run up on that high-speed train from Madrid and make a daytrip out of the city, but I ended up staying two nights here and really enjoyed taking it all in at a relaxed pace. 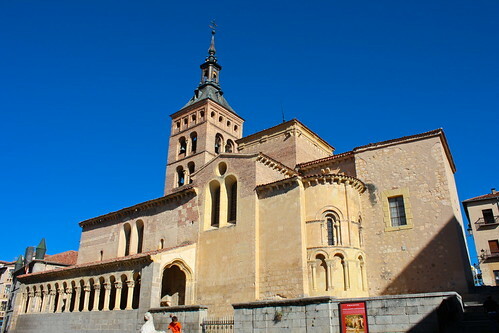 Although Segovia is well-known for its massive Roman aqueduct, its impressive Gothic cathedral, and fairy-tale castle, I think the city deserves more credit for its Romanesque churches and tasty food. It’s the only major city I’ve traveled to in the vast north-central region of Castilla y León, but if Segovia is any indicator, I can’t wait to see more of Castilla in the future. Even though the Romans essentially stole the basic forms of their architecture from the Greeks, their invention of the arch—and its permutations in vaulted ceilings or domes—combined with their engineering prowess really revolutionized construction in ancient times. They brought “civilization” to cities across the Mediterranean world, partly by the wonder that was the aqueduct, a miles-long series of canals that bore fresh water from sources in mountains down to large settlements. This is something we take for granted in modern times, but it would have been a breakthrough back in the day. These aqueducts (literally “water channel”) were inclined at precise angles to keep water moving all the way to the cities, so whenever a valley opened up, vast, stacked arches had to be put up to support an elevated span. 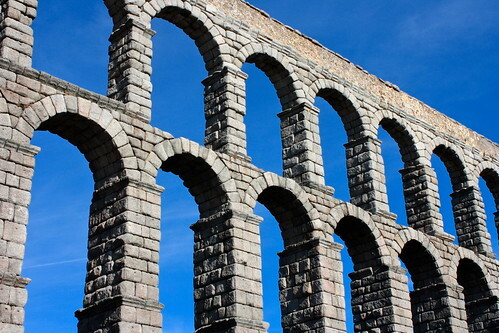 Few aqueducts remain in Europe, but the ones that do are truly amazing, like southern France’s Pont du Gard and this one in Segovia that cuts straight through a valley on the edge of the old town. During the reign of Ferdinand & Isabella, 36 arches were carefully rebuilt, and the aqueduct continued to bring water into Segovia through the 1800s. Most every big Spanish city has its own cathedral church to be proud of (and even some small ones, too! ), but after a while these Gothic, Renaissance, and Baroque churches all kind of mush together in your memory. Segovia’s cathedral, however, really stands out because it’s the youngest cathedral in the world that was designed in the Gothic style. You’d think a cathedral built in the late 1500s—the height of the Renaissance—would look something like what you can find in Jaén province, for example, but for whatever reason the segovianos just couldn’t let go of the Gothic. The result was stunning: the Late Gothic church has typical squared-off, boxy transept arms and lots of floral, pointy spires, very reminiscent of Sevilla’s cathedral. However, the Renaissance was too hard to resist, for the stained glass windows are joined in triplets, like a triumphal arch, and a central dome—unheard of in medieval times—ties everything together. When seen from the terrace of the Alcázar, the cathedral gleams in the afternoon sun with its soaring bell tower, transporting you to a scene from Tolkien’s Lord of the Rings, perhaps Minas Tirith, the White City of Gondor. 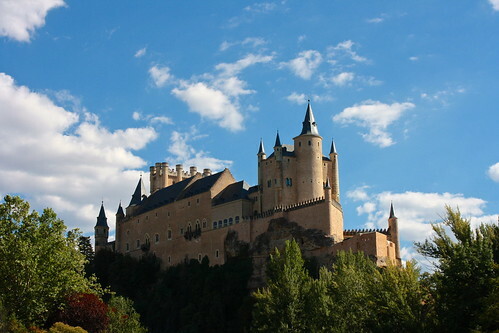 Segovia has arguably the prettiest castle in Spain, if not Europe. 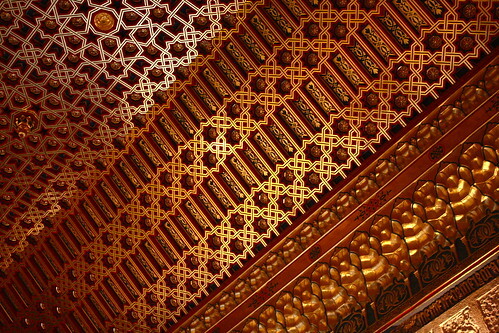 Although its name alcázar might lead to you assume it was Moorish in origin, the fortress was built almost entirely after the Christian Reconquista of the city in the Middle Ages. Over the years various towers and halls were added to create the complex we see today, although it was abandoned as a royal residence after the court permanently settled in Madrid. I was really excited about visiting Segovia for the monuments I just talked about in the section above, but when I began wandering the hills and streets of the old town I was struck at just how many Romanesque churches were still standing after almost a thousand years of history. In the High Middle Ages (think: after the so-called Dark Ages), the Romanesque style of architecture arose across the entire European continent as the first pan-European way of building churches and palaces since Roman times. It’s called “Romanesque” (románico in Spanish) because architects drew from the lingering artistic heritage of the Roman Empire when designing their projects. Thus you’ll find semicircular arches absolutely everywhere: from doorways to windowpanes to bell towers and even the inside’s barrel-shaped vaulting. 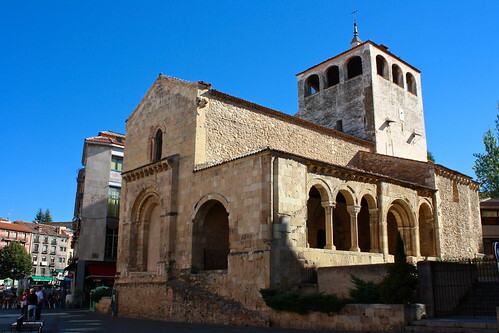 Most churches, especially in Segovia, have nice covered patios with a long line of arches jumping from one end to the other in what’s called an arcade. Although this style of architecture is much heavier and darker than the tall, airy Gothic style that came after it, I find it very unique and a link to the more-distant medieval European past. There’s a good dozen or so Romanesque churches scattered across the old walled city as well as outside it, although they’re usually closed unless you happen to visit them before or after Mass. They often pop out of nowhere, hiding in between modern apartment blocks or on the corner of grand public squares, and make for pleasant surprises in this already gorgeous city. I really enjoyed entering the 12-sided Church of la Vera Cruz on a hill outside the walls to the north. 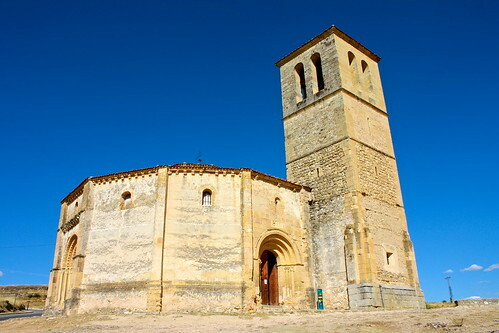 It’s a bit of a steep hike down the promontory and then back up onto the plains, but the church also serves as a little mirador or lookout point of the city. The interior is really unique because instead of being oriented in a Latin cross fashion, three apses open into a circular nave in which there’s a central aedicule or “little building.” You can climb up some stairs to a small, round room on the upper floor and wonder what sort of conversations would have been had by the knights of the Order of Malta, who continue to take care of this church today. The star of the Segovian kitchen, though, is cochinillo asado, roast suckling pig. It sounds, um, gruesome, but the combination of crunchy, smoky skin and the most tender, juicy pork you will ever eat is mind-blowing (and wallet-emptying!). A typical dessert in town is called ponche, a dense, marzipan-like cake that had me sighing while I snarfed it down at dusk at the Plaza Mayor. 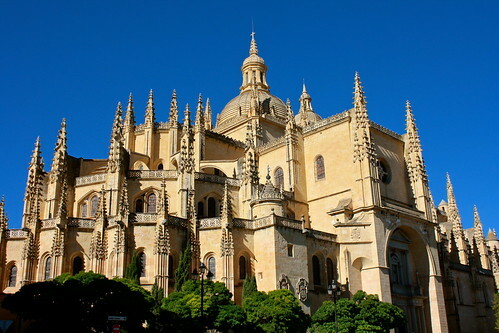 What’s your opinion of Segovia? Would you consider daytripping here if you happened to be in Madrid? Join the discussion in the comments below. 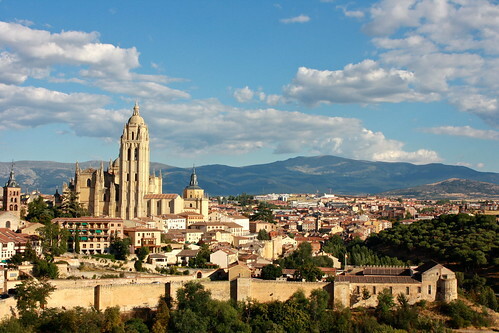 Is It Blasphemy to Dislike Granada, Spain?